Pre-social media, when the only two options for long-distance communication were snail mail or costly international calls on a land line, I was a young bride in Argentina. There were days when I felt a million light-years from my family and familiar friends. That’s when I learned what it means to be alone, yet not lonely. Elderly Juan José lived outside of our city in a community of precarious thatched-roof, cracked-mud-floor, one-room homes. His work vehicle was a custom made tricycle with a huge, cumbersome box on the back. Battered and worn, it bore the marks of countless trips into town. There, Juan José daily picked up freshly butchered meat at the central market, and literally “peddled” it to his neighbors. It was hard work. Juan José was robust, but like his tricycle, he was old and battered. As church planters, several of us went to visit Juan José one day. Inquiring about his family, he replied that he had no one; no siblings, spouse, children…he might still have had a relative in Brazil, he wasn’t sure. All alone, Juan José was content, because He knew God was with him. An hour before most church services, we would usually find Juan José in the meeting hall, alone. Kneeling in prayer, we could hear him audibly and passionately worshiping God, who was with him. Juan José knew the secret that I had yet to learn. He was walking hand-in-hand with the Lord. Multiple times throughout the Bible, we read God’s reassuring promise: “I will be with you.” As His children, we can live with that assurance, just like Juan José did. Alone? Maybe. Lonely? Never! Our God is with us! Porque somos humanos, no somos perfectos. Todo lo que hacemos es imperfecto; nuestros pensamientos y nuestras actitudes están lejos de la perfección. Los planes y proyectos que hacemos tampoco salen perfectos. Toda mujer que ha amasado algo alguna vez puede testificar de por lo menos un “desastre” que salió de su horno: crudo, quemado, duro, chorreado…ya saben a qué me refiero! Hace unos años, viviendo en Argentina, nuestro querido amigo Juan viajó alrededor de 3 horas desde Paraná para pasar el día con nosotros. Como Juan es goloso, le preparé una torta de manzana. Al cortar la torta – para mi sorpresa y horror – vi que aún estaba cruda en el medio. Sin decir nada, y disimulando el fracaso, de todos modos la serví de postre. Una y otra vez, Juan expresó, “Ay, Kath! Qué rica! !…y tiene como un “flan” en el medio! Qué rica!” Lo que nunca supo es que fue una torta imperfecta hecha por una mujer imperfecta. No tratemos de entender todos los “por qué”, ni los “cómo”; tampoco gastemos nuestras pocas fuerzas en proyectos para perfeccionar lo que no tenemos la capacidad de perfeccionar. Dios es perfecto y TODO lo que El hace es perfecto, incluyendo nuestro camino. El mismo está trabajando en nuestras vidas, y podemos alabarle ahora mismo, porque las tortas que El saca del horno nunca tienen “flan” en el medio. Sí, ¡EL perfeccionará mi camino! Looking for “Q” blessings, I discovered that they aren’t real common, so I’m going to list only one. Quince. 1 egg to paint the top of the tart. Mix the flour and sugar in a large bowl. Cut the butter in until it is in very small pieces, lentil sized. Add the slightly beaten eggs and vanilla, and mix until the dough is consistent. Do not knead or over mix it. Let it rest in the fridge while you prepare the dulce de membrillo. Cut the dulce de membrillo into dice-sized pieces, put it in a bowl with about 2 Tbsp. water, and heat it in the microwave for 1 minute. Take it out and smash it with a fork so it’s spreadable. Set it aside. Preheat the oven to 375°. Take the dough out of the refrigerator and divide it in 2 parts. You should have about 2/3 of it for the tart and 1/3 for the lattice top. Roll out the larger part on a floured surface and place it on the bottom and about 1” up the sides of a 10” tart pan with a removable bottom or a 9 x 13 pan, previously sprayed or greased. After placing the dough in the pan, spread the dulce de membrillo on it and trim the edges. Roll out the remaining dough using a pizza cutter to cut finger-width strips for the lattice. Place the strips on top of the dulce de membrillo and paint only the lattice with beaten egg. Bake for about 20 minutes, or until nicely browned. Enjoy your “Q” blessing! Why 100 years? Because 100 years ago today, baby Helen was born to Mathias and Susan Pamer. Helen grew up to marry my Dad, and become known as “Mom” to my five siblings and myself (in that order). Since our conversation last evening, I’ve been thinking how prenatal care and childbearing have evolved in the past 100 years. My grandma probably never even heard of prenatal care. Like most farm women of her era, she probably kept on working from sun-up to sundown, washing clothes by hand, hauling water from the pumphouse, hoeing the garden, gathering eggs, baking bread and feeding the animals. She already had 2 little girls, tagging along and hanging onto her long skirt. Nothing about her life was easy or comfortable, and much less when it was time for the baby to be born; no running water, no electricity, no phone, no central heating or AC. No medical professionals; just the neighborhood midwife. Complications were common and often fatal 100 years ago. What a stark contrast to today’s conditions! While childbearing circumstances changed so dramatically in 100 years, I realized that some things have not changed, and never will: a mother’s love for her child; the sacrifice a mother is willing to suffer for her child; the protection, provision and care she gives her offspring. Those things haven’t changed. Grandma was a godly woman, and I’m sure that she prayed often for each of her eight children, experiencing God’s peace in the realization that He loves them far more than she ever could. I’m positive that her prayers for baby Helen – and all her children – were the very same prayers that godly moms today offer on behalf of their own children – no matter how old they are! One hundred years later…some things changed, but some things didn’t. IT’S A LOT EASIER WITH A PATTERN! Sewing was an important part of most of my life. When I was in my early teens, my cousin Betty Lou, who lived next door, helped me understand a pattern, cut out a dress and make it. I was delighted to wear my new turquoise dress for Easter that year, and that experience was the beginning of many years of sewing. Because I loved to sew, Mom paid $100 towards a $169 Singer portable sewing machine that I took to Argentina as a new bride. It didn’t take long to discover something…there were no patterns available in Argentina at that time! No Simplicity! How could I sew without a pattern? With some ingenuity and a lot of creativity, I figured out how to make my own patterns on brown paper, and made a lot our kid’s clothes during their growing-up years, and many of my own as well. There’s one thing I learned by making all those home-made patterns: it sure is a LOT easier to sew WITH a pattern than WITHOUT one! Reading through all of Philippians to see what pattern he set, we find that Paul’s pattern was simply having an eternal perspective. In prayer and intercession; in the love he had for his fellow believers; the encouragement, instruction and mentoring he did; his willingness to sacrifice himself for the cause of Christ; his boldness in sharing the gospel; his attitude towards his past and vision for the future …everything he did, lived and taught was done with an eternal perspective. THAT’S the pattern he set, and here’s what I’m discovering: it’s a lot easier to follow Paul’s pattern of having an eternal perspective, than it is to try to wing-it through life without it! Mom was right; loss isn’t always a bad thing. At the time she made that statement, she had lost her independence; she lost her ability to even dress herself; she lost many of her family members who passed on to eternity; she no longer enjoyed her mobility. Macular degeneration took its toll on her vision, and if she didn’t have her hearing aids in she couldn’t understand us even if we shouted. Her coherent mind was a thing of the past. She had a lot taken from her… but she was OK with that, because she saw God clearer! Job agreed. After all the loss he suffered, coupled with tremendous physical pain and accusing friends, he was in the restoration process when he declared to God: “I have heard of You by the hearing of the ear, but now my eye sees You.” (Job 42:5) Sometimes when God takes something away from us, it paves the way for a clearer vision of Him, His work in and around us, as well as His love for us. Don’t think loss is always bad. When God takes something away from you, be on the lookout! It might well be that He wants you to see Him more clearly. And that is good! Today I did something that I’ve been wanting to do for a very long time. I made homemade strudel. As I gently stretched and pulled the tender dough around the kitchen table, I realized that I have a long history of strudel. I thought of all the “Strudel-Makers” who were part of my life, and what I learned from them. Let me share that with you. Sometime between 1913 and 1920 when my paternal Grandma passed away, she made a lasting impression on her youngest son, George. Not only did she make “the cake that you walk around the table to make” (The way he referred to strudel in his childish language), she taught God’s Word to my Dad – and no doubt to her other three children also – with a huge, illustrated German Bible. Even in his 90’s, Dad would get teary-eyed each time he related that she read that Bible and sang “Who Is He That Careth For Us?” with him on her lap. From the grandma I never knew, a Strudel-Maker, I learned the importance of teaching God’s Word to the little ones He loaned to us. In the 1960’s, my maternal Grandma, originally from Austris-Hungary, taught my sister to make strudel. She made apple strudel and nut strudel. Grandma always had a generous heart, and was known for making an extra pie or whatever she was baking – to give away! From this Strudel-Maker, I learned how important it is to share what God’s given us. Early 1970’s: I was in college when Aunt Katy was in her 80’s. Aunt Katy was my Dad’s aunt, “famous” for her incredibly delicious strudel, so I asked her if she could teach me how to make it. She was thrilled that she could teach me something that no one at the University of Akron could! Aunt Katy’s health was very precarious for many years, but when asked “How are you doing, Aunt Katy?” she never failed to respond with an emphatic “Thankful”. An elderly Strudel-Maker with a grateful heart taught me how important thankfulness is, in every situation. In the 1980’s and 1990’s, living in Argentina among a largely German population, making strudel was very common. What WASN’T common was the love that Ema put into every batch of strudel she made, even for our youth camps with 100+ in attendance. Ema was the cook at the Peniel Bible School where young men and girls studied to be missionaries, evangelists and pastors. Ema untiringly served them, knowing that she was serving God. From the example of Ema, an unforgettable Strudel-Maker, I learned how important it is to serve God’s people, and to do it with a real servant heart. While living in Argentina for 27 years, there was another Strudel-Maker who left a tremendous impression on me: my mother-in-law. Born and raised in Yugoslavia, strudel was almost a staple for Ana. It was no big deal for her to whip up a double recipe. She made quite a variety of strudel: apple, squash, ricotta with sautéed onions, potato, cabbage, ham and cheese. When making strudel, she always made sure she had enough of each kind to be able to send some to each of her three children. Ana taught me that when love is the motivation, no task is too big. She also gave me the recipe I use, which I cherish. So as I thought about my “strudel history”, remembering all of these Strudel-Makers, I thanked God for each of them. They all impacted my life. Don’t I want to use Phyllo dough?… Puff pastry? …No, thanks! P.S. My strudel came out YUMMY! The year was 1954. There were six children in our family between 15 and 3 years of age when Dad was laid off at Firestone. Thankfully, he didn’t see it as the end; he saw it as a new beginning. Being tired of the daily grind in the “rubber shop”, Dad took a leap of faith and started his own business, “Pavkov Sand and Gravel”, doing grading and excavating. Times were tough as he built his reputation and clientele. Not only did he have to provide for himself and mom, plus six growing kids; he also had to pay his employee/s and was buying machinery for the business, very often covering the expenses of costly repairs on the machines. Dad worked hard, putting in long hours to pay the bills and meet all of our needs. Under these circumstances, we grew up learning that there were things that we could “do without”; that was good! Looking back on those years, I can see that God used them to train me for the future. As Jorge and I raised our family of three children in Argentina, we saw lean times and often had to “do without”. Just like in my childhood, our life was simple and God always met our basic needs. By the generosity of many family members and friends (to whom we are forever grateful! ), God showed us His faithfulness over and over. Our children also learned to “do without”; and that was good! And now?… We can appreciate that He used all those years of training to get us where we are now. There were a lot of things that we “did without”, but God never failed us; we never had to beg. Because we’ve learned to “do without”, out of necessity, we are choosing to continuously apply that wise principle of frugality and simplicity to our living. We realize more and more that everything we have is a gift of God’s grace, and we can totally agree with the Psalmist who wrote: “I have been young, and now am old; yet I have not seen the righteous forsaken, nor his descendants begging bread. He is ever merciful, and lends; and his descendants are blessed” (Psalm 37:25,26)…and THAT IS GOOD! The Righteous Shall FLOURISH Like a Palm Tree! As newlyweds living in Argentina, my husband Jorge and I were part of a team of 3 couples who were planting a church in a new town. As part of our ministry, we went door-to-door with tracts and the Gospel message, and visited the people who showed interest in hearing it. I can still remember the day that we visited Rosa Cornejo and her husband in their home. Like nearly all the people we worked with, they were extremely poor. When we invited them to church, Rosa said she didn’t have decent clothes. Looking around at their living conditions, I truly believed her. Dirt floors. One lonely lightbulb hanging from the bare rafters. Sparce furnishings…So I wrote (snail mail…we’re looking at the 70’s here…) a letter home to Mom asking if she had a dress in her closet that she could spare, and maybe send it down for Rosa, so she could attend services. That request was the beginning of a ministry that my Mom, who was 62 or 63 at the time, dedicated the next 30 years of her life to. Having traveled extensively in Argentina, Brazil, Uruguay and Paraguay with Dad, she saw the poverty and having received that request, felt God prompting her to do something. She started to send boxes of good used clothing to pastors, missionaries, church leaders that she knew and loved, and the orphanages she had visited. Dad cleaned out the basement, put in fluorescent lighting, long tables, a packaging area, and Mom went to work! She had dozens of boxes that she used to sort the clothes by men’s, women’s, children’s, and by size. She had a very detailed mailing list with every pastor, missionary and church leader, along with their sizes, the sizes of every one of their family members, and details only she understood! Our family was one of countless families that dressed from her boxes for years, and we are thankful for that! When family, neighbors and friends found out about her ministry, they started dropping off bags and bags (big, black garbage bag size) of their used clothing. Their walk-in basement door was never locked, so it wasn’t strange for people to walk in and leave their clothes any time. She set up a bank account for her ministry and churches often sent special offerings to pay for the shipping. A special friend arranged for her to have a never-ending supply of boxes to put together and strapping tape. She washed and mended the clothing, sending only the best. She packed and shipped hundreds of boxes per year, (over 300 per year the last years of her ministry) often hauling 25-35 of them to the PO by herself. When she couldn’t lift and carry any more, God always sent someone to visit her who she “volunteered” to take her and the boxes to the PO. So she continued till she was 93 years old. That’s when we had to tell people not to bring her anymore clothing, because physically she could not handle it. The last two years of her life, Mom had Alzheimer’s. She didn’t recognize her own children and grandchildren anymore. She didn’t know whose home she was in, even though it was her own for over 60 years. In spite of the confusion and mental haze that she suffered, Mom would still say “I’ve got to get downstairs and take those boxes to the PO. They’re ready to go…” She was 95 years old, and FLOURISHING!! Mom walked close with the Lord. 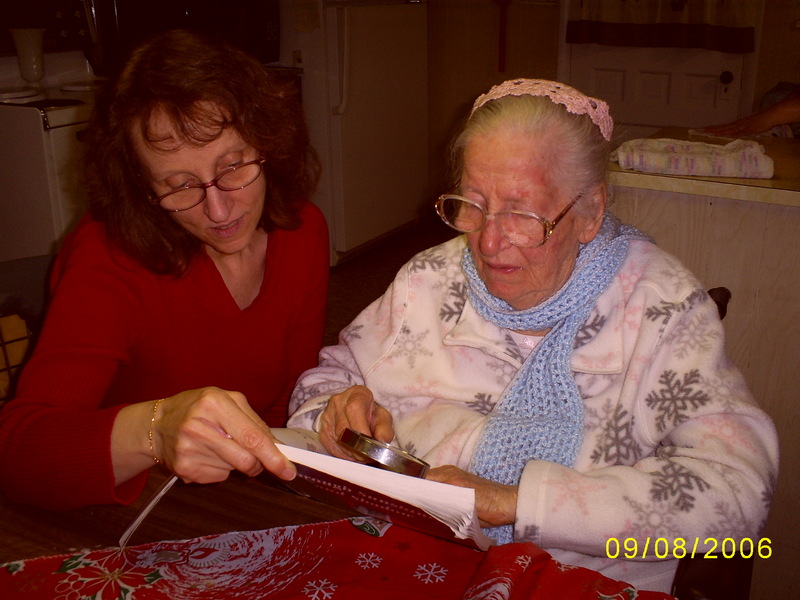 Even in the days before she passed away, she often read her worn Bible with a page-sized magnifying glass. Because she loved Him, she FLOURISHED, blessing countless lives. She was a living example of a godly woman, FLOURISHING like a palm tree, bearing fruit even in old age. That’s how I want to be! How about you?